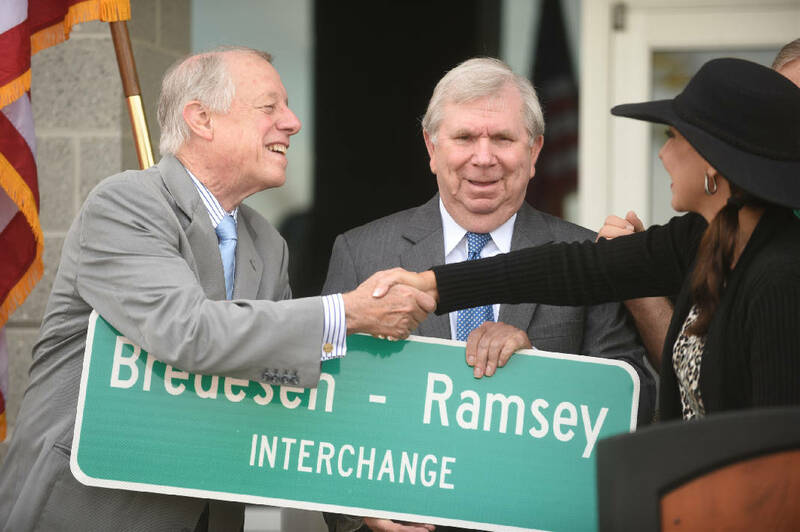 Former Governor Phil Bredesen, left, is greeted by Hamilton County Commissioner Sabrena Smedley, right, as former Hamilton County Mayor Claude Ramsey looks on during an October 2015 event naming the exit 9 Interchange on I-75 after Bredesen and Ramsey. The exit is near the Volkswagen plant at Enterprise South. Tennessee's race to fill the seat of Bob Corker is among the make-or-break contests in the country as Democrats hope for a blue wave. In Phil Bredesen — a well-liked, moderate, former two-term Tennessee governor — we have the best conservative, independent, Democratic candidate we could possibly hope for. Even Corker speaks highly of him, and calls him a friend. Much to the chagrin of Senate Majority Leader Mitch McConnell, Corker in April predicted that Bredesen — a very successful businessman who also served two terms as Nashville's mayor — would appeal to some Republican voters. U.S. Rep. Marsha Blackburn, on the other hand, in announcing her bid for Senate soon after Gov. Bill Haslam said he'd pass on the seat, called herself a "wingnut" and a "knuckle-dragging conservative." The message was clear. She planned to cling to the coattails of wingnut President Donald Trump. Bredesen and Blackburn both face nominal opposition in the Aug. 2 primary (early voting starts Friday), but each will be their party's nominee. After that, the race is close. Blackburn backed away from the Trump stamp a bit when she visited the Chattanooga Times Free Press recently for a Facebook Live segment. She sung Trump's praises until questions turned to tariffs. Then she said she had "concerns." Early voting for the Aug. 2 elections begins Friday and runs through July 28. The moment was just one of many when Blackburn demonstrated she is no Bob Corker. To this day, Corker, who has had run-ins with Trump at times and supported him at times, stands in steadfast and outspoken opposition to Trump's tariffs. For weeks, Corker has been rallying the Senate to claw back the tariff-imposing authority Congress granted the president decades ago in the name of national security. Yet Senate leadership has blocked an up-or-down vote. On Wednesday, the Senate voted 88 to 11 to adopt "a non-binding motion" to provide Congress a role on tariff setting. Corker, along with Sens. Pat Toomey, R-Pa., and Jeff Flake, R-Ariz, said he will continue to push for a binding vote. Phil Bredesen is a Corker — and then some. "I'm running for the Senate because I have the right kind of experience and the actual track record to work across party lines to solve problems and begin to fix the mess in Washington, Bredesen recently told the Times Free Press. "Tennessee voters can pick an eight-term Congresswoman who's been helping create gridlock in Washington, or they can hire someone who is an independent thinker." If you need an example of Blackburn's predisposition for creating gridlock, look no further than our nation's opioid crisis, which began in the 1990s with the over-prescription of painkillers like Oxycontin and other generic hydrocodones. Drug manufacturers told doctors those drugs were less addictive than they really are, and when the prescriptions proved habit-forming, some patients progressed to a heroin addiction. In 2014, a synthetic opioid that is 50 times more potent than heroin — fentanyl — came on the scene from China, pouring gasoline on the fire. Today, drug overdoses have become the leading cause of death among Americans under 50. Health officials say more than 95 million people used prescription painkillers in the past year — more than used tobacco. But Congress, if anything, has helped the drug makers continue the opioid epidemic — like when Rep. Blackburn pushed legislation that had the effect of shutting down Drug Enforcement Administration investigations of opioid pharmaceutical distributors. In 2014, Blackburn joined with Rep. Tom Marino, R-Pa., to write a letter accusing then-DEA Office of Diversion Control Joe Rannazzisi of trying to "intimidate the United States Congress." Blackburn and Marino asked for an Inspector General's probe into Rannazzisi — who was issuing fines and trying to make additional cases against pharmaceutical distributors making "suspicious" deliveries of opioids. One example of "suspicious" was 9 million hydrocodone pills delivered over two years to a pharmacy in Kermit, W.Va., where the town's population was just 392 people. Blackburn, who received $120,000 in campaign contributions from the pharmaceutical industry between 2013 and June 2017, and Marino, who received $92,500, went on in 2015 to push a bill that substantially raised the legal bar on the DEA's ability to crack down on the drug distributors, including the DEA's ability to freeze suspicious shipments. She wrapped her bill in the American flag, saying the legislation was needed to help people with pain — like our veterans — have steady access to medication. Blackburn's bill passed in 2016 with no opposition in either the House or the Senate. And why not? Overall, the drug industry spent $102 million lobbying members of Congress between 2014 and 2016, according to a Washington Post review of lobbying reports. Later that year, after a "60 Minutes" and Washington Post exposé about the lawmakers' DEA interference and hindering legislation, Blackburn backtracked: "If there are any unintended consequences they should be addressed immediately," her spokesperson said. In November, she had the consummate gall to issue a news release heralding her co-sponsorship of a bill to create an opioid task force. Of course, that task force's work would be aimed primarily at fentanyl and heroin from China — not pharmaceutical opioids. Bredesen correctly notes that out-of-control partisanship is killing our country, and he said both conservative and liberal Tennesseans are telling him they are "fed up with people standing in opposite corners of the room and yelling at each other" and never getting anything done. "I will bring the tools I learned doing this [keeping Tennessee in good shape through the Great Recession with no new taxes, weathering the pains of TennCare and improving K-12 education] and a bipartisan, nonconfrontational attitude to Washington. I'm not there to support any political party, or to oppose the President, but to do what the people of Tennessee need done." Corker says that whoever wins, he hopes he or she will follow the model of past Tennessee senators, such as Republicans Howard Baker Jr., Bill Frist, Fred Thompson and Lamar Alexander and Democrats Al Gore and Jim Sasser. He termed them "statesmen that have been willing to burn political capital to solve our nation's problems." The records of Bredesen and Blackburn make it clear that if real problem-solving is the goal, Tennesseans had best vote for Bredesen.